Sperm whales were the main quarry of American whalers from about 1712 to 1870. Tiny wooden ships of 200 tons or less and under a 100 feet long would often set off on voyages that took them around the world for 3 to 5 years. Needless say there is much lore and many stories of adventure and mishap that occurred during these days. Some of these are recounted here. but as soon as we ranged alongside, I realized that I was booked for the sailor's horror - a cruise in a whaler. were not always a one-sided affair. On the 20th of November 1820, the Nantucket whaling ship ship Essex (87 feet long with a 21 man crew) found a group of sperm whales in the South Pacific, the whaling boats were launched and the hunt began. A man named Owen Chase the first mate harpooned a large bull which trashed about with its hugely powerful flukes and smashed a hole in the boat. The men on the boat managed to stuff some cloth into the hole, reluctantly cut the whale loose and made it back to the Essex safely. This in itself was not an unusual occurrence, whale boats not uncommonly sustained damage from whales and a certain amount was expected. What Owen Chase and the other whalers saw next however was most definitely unusual. The stricken whale had come close to the ship and was swimming headlong towards it, Chase recalled "He came down on us with full speed, and struck the ship with his head ... and he gave us such an appalling and tremendous jar as nearly threw us all on our faces." The whale had made a hole in the stout timbers of the ship and the crew began to pump out the water and attend to the hole. A few minutes later however and one of the crew shouted out "Here he is - he is making for us again". Chase said "I turned around, and saw him ... coming down apparently with twice his ordinary speed, and to me at that moment, it appeared with ten-fold fury and vengeance ... The surf flew in all directions about him, and his course towards us was marked by a white foam ... which he made with the continual thrashing of his tail; his head was about half out of the water, and in that way ... he came upon, and again struck the ship." The ship had been so badly damaged by the enraged whale that the crew had to abandon her. There were two other whaling boats out hunting at the time and by the time they returned to the Essex, she was nearly all below the water. Few supplies were able to be recovered from the Essex and the crew set them selves to for a row of over 1000 miles. They were about 2 000km (1 250 miles) from the nearest land (sperm whales are creatures of the deep sea and are not usually found near to land) in three small open boats with very few supplies. The voyage to rescue was terrible with little food or water. Their bread was soaked and too salty to eat once dried out, when it eventually rained and the rain caught in the sails, the sails were so salty from earlier wettings with sea water that the rain was too salty to drink. For ninety days they drifted slowly dying of thirst and hunger, the survivors eventually eating the dead. Of twenty one men shipwrecked, only eight survived. Along with the story of the Essex above, this is the only other certain case of a ship being attacked and sunk by a whale. This account is related from "Whales and Whaling" by Charles Boardman Hawes published in 1924. "The New Bedford whaler Ann Alexander was cruising the offshore sperm whaling grounds in the Pacific on the 20th of August 1851. Whales were sighted and two boats sent out. About noon the mate's boat struck a whale and was off on a "Nantucket sleigh ride" when the whale stopped, turned on the boat and "chawed it up". The other whaling boat with the ships captain John S. Deblois came to the rescue and the men taken back to the ship. Once again the men went out to search for the stricken whale and once again the mate's boat made a strike and was smashed up requiring another rescue by the captain. Once on the ship, they headed for the whale who at last sounded (surfaced) and began to swim rapidly towards the ship. As he came near the ship "hauled on the wind" and let him pass. They tried to get another chance to strike, but it was too late in the day and the chase was given up for that day. The ship was making about 5 knots and the captain was at the rail when suddenly he saw the whale rushing at the ship at about three times her speed. There was no time to make any avoiding action and the whale struck the ship which juddered as if she had hit a rock. The whale had hit abreast of the foremast about 2 feet above the keel and had knocked a great hole through the bottom. Water rushed in and anchors, cables and anything that might help keep her afloat was thrown overboard. Finally the captain ordered all hands into the only two boats that were remaining while he jumped from the sinking ship into the sea and swam to the nearer boat. The ship lay on her beam ends (on her side) with topgallant yards under water (ropes servicing the uppermost sails). They waited by her all night and the next day the captain boarded her - none of his crew would take the risk - and cut away the masts. She then righted herself and they were able to retrieve some supplies and set out for land. They must have all known the grim story of the Essex and its crew, but had no other choice. Fortunately for them however, two days later on the 22nd of August, the ship Nantucket from that town picked them up and took them to land." The story then goes on to claim that the New Bedford whaler Rebecca Sims struck and saved a large whale and found two of the Ann Alexander's harpoons in him along with several pieces of ships timbers in his head - this latter part does seem to be stretching the story a little too far - for the sake of a better ending to the yarn maybe? there are no authenticated instances of this - though there are many tales with varying degrees of realism. "Well authenticated facts" were found"while browsing through some old records"
"A whaling ship, the Star of the East was cruising off the Falkland Islands. A huge cachalot whale - the toothed sperm-whale of southern waters - surfaced, and a whale-boat was dispatched in pursuit. In the struggle the whale-boat was smashed to pieces and it was found that a young seaman named James Bartley was missing. The whale was killed and brought alongside. The next morning the flensers had been busy for two hours when they noticed a strange undulating movement in the whales stomach. They slit it open and found James Bartley doubled up inside unconscious. It is stated that he required four weeks to recover sufficiently to tell his tale. He had found himself engulfed and sliding down a slippery channel, the walls of which quivered at his touch. The great heat of the whales stomach "drained all his strength"; then he remembered no more until he woke aboard the ship. The whales digestive juices had permanently bleached Bartley's face, hands, neck and arms as white as snow. The opinion was expressed that a strange combination of circumstances had given him his million-to-one chance of survival: (1) The whale's "serrated teeth" had missed his body. (2) The whale had soon been killed, which lowered its body temperature." This is certainly a hoax the like of which seamen traditionally reserve for the gullible. In the nature of such hoaxes it is of course impossible to disprove claimed events in the past. Several factors point in this direction; no source is quoted, merely "browsing through old records". The "well authenticated facts" are given no authenticity. If a man were swallowed by a whale, he would be entirely without oxygen and the temperature would accelerate heat stress causing him to die very quickly. Even if a sperm whale could swallow a man (see below) a live unharmed one would certainly put up a fight (wouldn't you?!) requiring him to be bitten and subdued, possibly (probably) killed in the process. after P. Budker 1959 - "Whales and Whaling"
"I was greatly interested in the letter appearing in your April publication (above)concerning the incredible incident of the unfortunate seaman, Jas. Bartley, who was swallowed by a sperm-whale and lived to tell the tale. My interest is in a sense personal because of my small part in a similar though not so fortunate accident. Incidentally, I am inclined to agree with Dr. Murphy's remarks concerning the dubiousness of the tale quoted. It was in February or March 1893 or 1894 when, as a young surgeon, I was attached to the sealing fleet out of St. John's, Newfoundland, as much for the adventure as for my "sealer's share" of the trip. We sailed on the schooner Toulinguet, one of a considerable fleet of wooden ships bent on a winter's take of seal pups. One of the lads in another ship had the misfortune, in full view of his comrades, to become isolated from the others on an ice pan, from which he fell into the icy waters in the proximity of a huge sperm-whale. The whale was apparently as lost and out of season in those Arctic waters as he was confused and angered by the sudden appearance of a fleet of ships and men. Somehow the poor fellow was swallowed by the whale, which then made for one of the smaller sealers. A lucky shot from a small cannon mounted on her stern mortally wounded the huge mammal and served to change his course, though he travelled a full three miles out to sea before his final death thrashing. The next day he was found belly-up by one of the long boats as it was searching for a seal: and although it was impossible under those conditions to bring him in, the men, by a valiant effort and many hours of hard labour were able to hack their way through his abdomen below the diaphragm and isolated his huge gas-filled "upper stomach" which apparently contained their comrade. This was severed with some difficulty at the cardia and in the first portion of the duodenum, They brought it to me for inspection and also for preservation of the man's body, as it was hoped he could be returned to his native Argentia (Newfoundland) for burial. At first I attempted the dissection with my scalpel, but quickly gave it up in favour of one of the sharpest galley-knives. The stomach was finally opened and gave off an overpowering stench. A fearsome sight met our eyes. The young man had apparently been badly crushed in the region of his chest, which may have been enough to kill him out-right. (In any event, an examination of his lungs revealed a general atelectasia with marked haemorrhage throughout.) The most striking findings were external, however: the whale's gastric mucosa had encased his body (particularly the exposed parts) like the foot of a large snail. His face, hands, and one of his legs, where a trouser leg had been pulled up or torn, were badly macerated and partially digested. It was my opinion that he had no consciousness of what happened to him. Curiously enough some lice on his head appeared to still be alive. The appearance and odour were so bad that all save I were forced to turn away, and we were obliged to consign him to the briny deep - the last resting place of many a good sealer - rather than carry him back to his rocky homeland. I believe this tends to corroborate Dr. Murphy's remarks." Boston, Mass - Egerton Y. Davis, Jr. The last story did indeed appear as "A modern day Jonah" in "Natural History - June 1947" and subsequently in the book "Whales and Whaling" written by Paul Budker published in 1959. I then made it available on this web page in early 2004. After some correspondence and further research however with Mr. Jolyon Jenkins, a radio features producer at the BBC, it has now been determined that even this most likely sounding of the stories is false. The key feature to begin with was use of the name "Egerton Y. Davis, Jr". Egerton Y. Davis was a nom-de-plume used by Sir William Osler, an eminent English doctor in the late 1800's to spread tall tales. It seems that in 1947, someone (unknown) used the name with the "Jr." added for the sake of spreading another tall tale in the style of Sir William Osler / Egerton Y. Davis. Osler had been dead for some considerable time at this point. A letter in a later edition of "Natural History" exposed the story as a hoax. So why was I (and Mr. Budker) taken in by this story and how can we tell it is untrue? Nearly all parts of the story are plausible, it was not uncommon for whales to be mortally wounded and lost, sometimes to be picked up later by the same or a different ship. Sailors were notoriously bad swimmers so the loss of a man overboard wouldn't be that rare. The description of the man starting to be digested is a bit odd but believable in the absence of any other existing description. One of the least likely parts is of the sequence of events that led to the "Modern day Jonah", a series of events get less likely the longer the sequence, the more so when the individual parts are themselves unlikely enough to start with. It is the use of the Egerton Y Davis name that seals it as a hoax however. If it is true, why assign it with a name that is synonymous with tall tales? Names of ships are usually given to strengthen the evidence, though are frequently very difficult to follow up. The ship Toulinguetis described as "..one of a considerable fleet of wooden ships..." sealing and whaling ships were often bought and sold between companies depending on how they fared in the previous season. A sale often meant a change of name, and while some ships were built especially for the purpose, others were just converted for use as whalers, so a "whaler" often described a ships use more than its design. The least plausible part is of a man being swallowed whole. Sperm whales can swallow large objects and there are accounts of them swallowing very large squid (their normal prey item), BUT squid are slippery, malleable and the length consists mainly of tentacles. Squid are often described in length for the extent of their tentacles (to appear more impressive), so a squid that is "25 feet long" (approx. 8m) can be considerably less wide across the widest part than a man across the shoulders. Swallowing a clothed man would need the widest part across the shoulders to go intact down the whale's gullet and with the added friction of clothing as opposed to the squid being slippery and without a full skeleton so allowing it to readily be squashed thinner. If a man could theoretically be physically swallowed by a whale (and even this theoretical possibility has never been proven), it seems exceedingly unlikely that any animal in danger of its life would pause in the middle of the struggle and take a meal. Especially a difficult one to swallow. Even the most enthusiastic "Jonah" believers don't assert that just any whale could swallow a man, so the implication is that it is on the limit of possibility for only the largest of whales. As mentioned, sailors were notoriously poor swimmers and whaling often occurred in high latitudes with low water temperatures, if the whaler was not rescued very quickly (within about 5 minutes) he would be lost, irrespective of whether a whale was around or not. 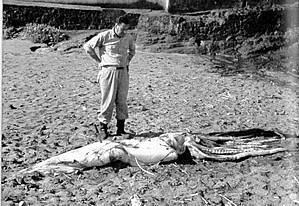 Giant squid, Arciteuthis sp. 34 feet (10.4m) taken from the stomach of a 46 foot (14m) sperm whale. The squid presents less difficulty in being swallowed by a sperm whale than the approx. 1.8m man would. Footnote - Why are Sperm whales suggested as the "man swallowers" when some rorquals are much bigger? First of all sperm whales are the largest toothed whales, the next largest - Orcas wouldn't be large enough. Secondly and most importantly, the large rorquals such as the blue whales, while notable for a whole host of extreme large size records, paradoxically have a very narrow gullet (oesophagus) only about 4" / 10cm in diameter - fine for swallowing small planktonic invertebrates and fish, but far too small to get even a single human leg down! The largest animal that has ever lived on earth would probably choke on a grapefruit. If you want truth to go round the world you must hire an express train to pull it, but if you want a lie to go round the world, it will fly: it is light as a feather, and a breath will carry it. It is well said in the old proverb; "A lie will go round the world while truth is pulling its boots on"